While serving with the Office of Central African Affairs, Render traveled to Burundi and Rwanda in March 1994 with Deputy Assistant Secretary for African Affairs Prudence Bushnell to advocate for peace. In 1993, representatives of ethnic Hutus and Tutsis had signed the Arusha Peace Accords in Rwanda but struggled to implement this agreement. Render and Bushnell urged Rwandan military and political officials to limit anti-Tutsi radio messages and provide security in the increasingly unstable region. Within a few weeks of their visit, violence exploded in Rwanda with both Tutsis and moderate Hutus as targets of a developing genocide. Released memos from Render and Bushnell document their frustration with the failure of response to this crisis from either U.S. President Bill Clinton’s administration or the United Nations. In following years, Render continued her service in Africa. 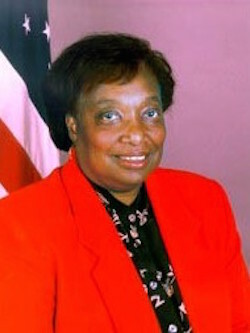 Despite her criticism of President Clinton, she was appointed as Ambassador to Zambia from 1996 to 1999 and as Ambassador to the Ivory Coast between 2001 and 2004. In Zambia, she played a role in critiquing anti-democratic policies of President Frederick Chiluba. In Ivory Coast, she coordinated U.S. troop support for the protection of foreign nationals when internal violence broke out in 2002. She also worked with the United Nations High Commissioner for Refugees (UNHCR) to aid refugees from violence in Liberia, then living in camps in Ivory Coast. More than 8,000 Liberian refugees were re-settled in the United States between 2003 and 2005. Following retirement from the Foreign Service, Render has continued to support attention to global affairs through participation in the American Academy of Diplomacy and in the Thursday Luncheon Group, an African American organization that promotes minority participation in U.S. foreign policy. “Appointments,” U.S. State Department, 1997, http://www.state.gov/1997-2001-NOPDFS/publications/statemag/statemag_nov-dec/statemag_aug/appoint2.htm; “Arlene Render,” https://history.state.gov/departmenthistory/people/render-arlene; “At Risk Liberian Refugees Reach Safety,” U.S. Refugee Admissions Program News, Volume 1, Issue 2 (7 November 2003), http://2001-2009.state.gov/g/prm/rls/27435.htm; “Key Diplomat's Personal Notebook Sheds Light on Inner Workings of US Government Response to Genocide Unfolding in Rwanda in 1994,” The National Security Archive, George Washington University, 30 January 2015, http://nsarchive.gwu.edu/NSAEBB/NSAEBB500/; “The President Names Ambassador to Zambia,” 13 May 1996, http://clinton6.nara.gov/1996/05/1996-05-13-render-named-ambassador-to-zambia.html; “Zambia,” Human Rights Watch World Report 1998, http://www.hrw.org/legacy/worldreport/Africa-13.htm.